Below are many volunteer opportunities for our students. Please us Sign Up Genius to volunteer for the various events. Packing & Sorting FoodWe need help sorting and packing bags of food for the big event! Shifts are available from 9:00 am to 12:00 pm and/or 1:00 pm to 4:00 pm each day. You can choose to work a few hours or all day.... it's up to you. We need help sorting toys (by gender and age group) so our families can pick out gifts for their children. Shifts are available from 9:00 am to 12:00 pm and/or 1:00 pm to 4:00 pm each day. You can choose to work a few hours or all day ... it's up to you. The BIG Day! Santa's Express Distribution Day! All instruction and tools will be provided. No experience necessary, but the project will require light lifting, bending, and moderate hiking. Bring lunch, drinking water, sturdy shoes, work clothes (long pants), work gloves, insect repellent, sun glasses, and sunscreen. Volunteer to Stuff the Bus!!! 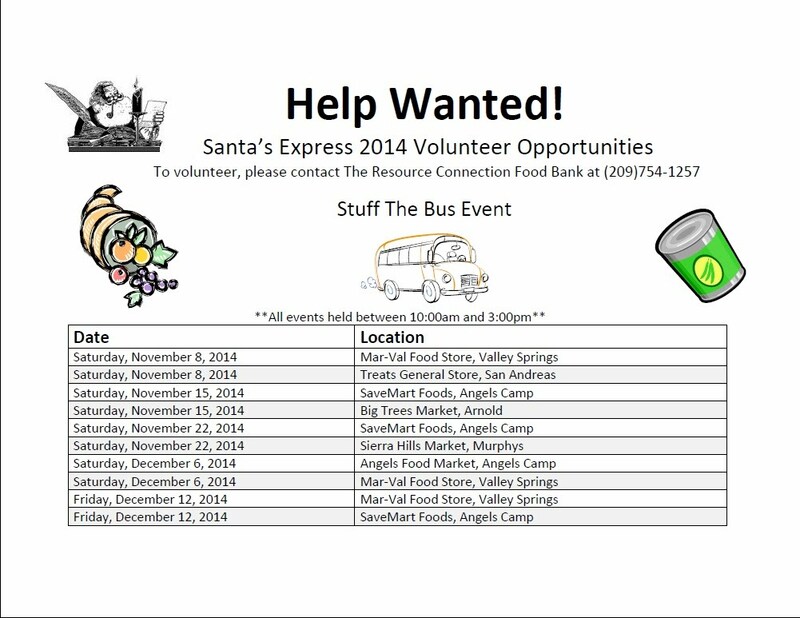 VOLUNTEERS NEEDED FOR STUFF THE BUS 2015!!!! holiday season. The goal is to fill an entire Calaveras Transit bus! The Food Bank needs help the week of September 14th through 18th from CUSD students not in school. Here is an opportunity for meaningful community service at a time when evacuees and fire victims need your help the most. Please come to the Food Bank in San Andreas at 206 George Reed Road off Pool Station Rd. from 9 am until late afternoon to help gather, sort, and distribute foods for fire victims. No need to call. Just come out and help. For more information, please contact Jeannie Hayward at 754-1257. On behalf of the victims of the Butte Fire we thank you for your service. The Foothill Conservancy is seeking volunteers for its annual Mokelumne River clean up on Sept. 19th. The cleanup will be from 8:30 to noon in two locations: at Electra Bar close to Electra Road and the Highway 26 North Fork Mokelumne crossing. Volunteers will pick up trash by the riverbanks and adjacent beaches. A special prize will be awarded to the volunteer with the weirdest trash. Volunteers must register in advance by visiting foothillconservancy.org or by calling Carolyn Schooley at 223-3508. Minors are welcome and encouraged but need to be accompanied by an adult 21 years or older. The Mountain Ranch Day in the Park Committee is looking for volunteers 16 years and older to help out at this event. The event is at the Mountain Ranch Park on Saturday, August 22nd from 10 am to 4 pm. Volunteers are needed from 7 am until 5 pm for parking cars, monitoring the bounce house, conducting family activities, serving food, and cleaning up. If you would be willing to help, please call Jim Pesout at 754-5543. Thank you for considering this community service. 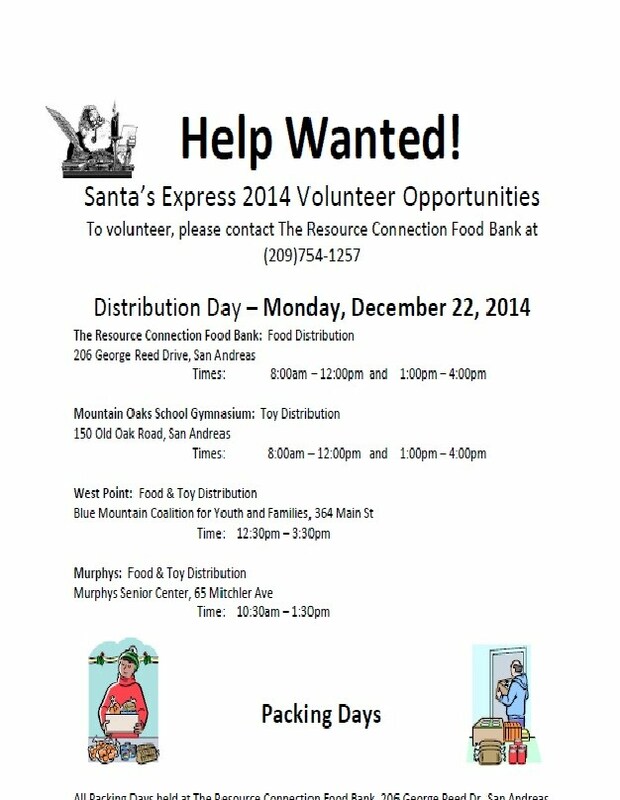 The Resource Connection Food Bank is requesting volunteers for our 2014 Produce Days. The Produce Days are held at The Resource Connection Food Bank every 2nd Friday of the month until October. The last produce day of the year is October 10, 2014. We need volunteers to sort and distribute the various fruits and vegetables that we receive the morning of the Produce Day. The volunteers will need to be at the food bank at 8am to help with the sorting and bagging of produce and will need to stay until 12pm for the distribution. With direct adult supervision, we can have minors as young as 16 volunteer. If you have any questions, please call Marianne at the Food Bank (209)754-1257.